Bank of America reiterated its moratorium Thursday on financing the production of military-style rifles. Furthermore, it hinted it may be planning to end its loan situation with Remington Outdoor Corp.
A Reuters report Sunday revealed Bank of America was helping finance Remingtons bankruptcy. In response, anti-gun activists took to Twitter with the hashtag #BoycottBankofAmerica. Thursdays press release affirms the companys position against firearms. 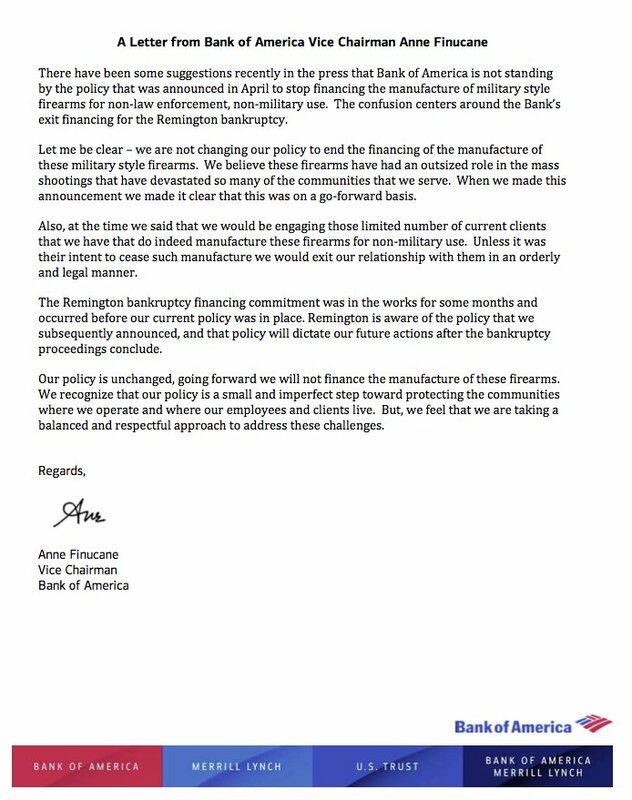 “Let me be clear – we are not changing our policy to end financing of the manufacture of these military style firearms,” Bank of America Vice Chairman Anne Finucane writes, claiming the $43.2 million bankruptcy loan was in place before the April 10th commitment. Furthermore, the letter indicates Bank of America may sell its financial participation once the gun manufacturer is out of bankruptcy. “Remington is aware of the policy that we subsequently announced, and that policy will dictate our future actions after the bankruptcy proceedings conclude,” the statement reads. Remington makes the Bushmaster AR-15, which was used in the stopping of a 2017 church shooting in Sutherland Springs, Texas, and in the 2012 murder of 26 students and faculty at Sandy Hook Elementary School in Newtown, Connecticut.